Constructed of diamond plate aluminum, this 3.4 cu. 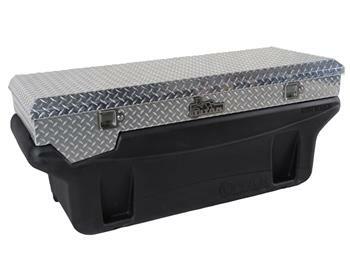 ft. (total) capacity, tool box bolts to the top of any of the above TITAN 60 gallon In-Bed Fuel Tank models to form a fuel tank/toolbox combination. Constructed of heavy-gauge aluminum diamond plate, it features plated locks for security and an air spring supported lid for convenience. Box has two compartments; one for tools and one which completely houses the fill neck, and fuel gauge. Box protects fuel, tank components, and tools from theft and the weather. Holds up to 100 lbs. of tools. Dimensions: 56.00” x 21.00” x 7.00” high.